Stayed in the Aventree Hotel in Seoul this weekend. The WiFi was pretty good for free. when I saw the iptime ssid I was expecting the usual hotel internet. 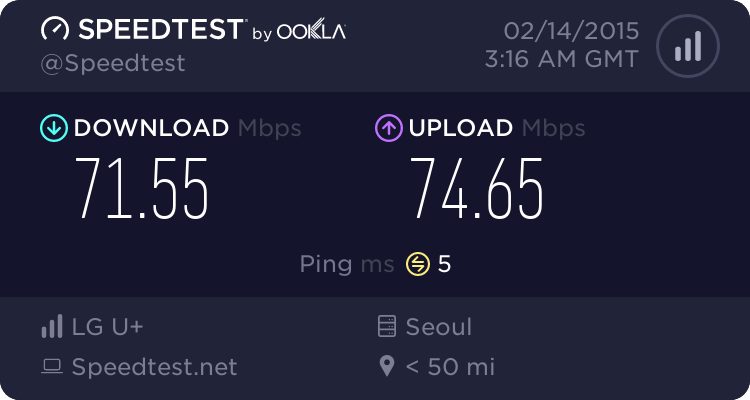 Korea's 2.4Ghz band is crowded to the point of being almost unusable in spots. 5Ghz is even bad in some areas. The congestion is one reason I look forward to 60Ghz WiFi. The crazy fast speeds are nice, but the lack of wall penetration will really be the big selling point to me. Especially in high density urban areas.